The Title "Oxford Advanced Learner's Dictionary 8th Revised Edition" is written by B. Victoria. This book was published in the year 2010. The ISBN number 0194799042|9780194799041 is assigned to the Mixed media product version of this title. The book displayed here is a 8th Revised Edition edition. The publisher of this title is Oxford University Press. We have about 84119 other great books from this publisher. 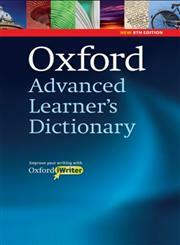 Oxford Advanced Learner's Dictionary 8th Revised Edition is currently Available with us.